We can produce your artwork as beautiful full-colour gloss vinyl stickers, contour-cut to the shape of the artwork- and these days, with the advances in solvent-ink digital printing, its cheaper than ever! Add additional designs for just £8 per design!! Either as PSD, AI, PDF, JPEG, TIFF or EPS files, at 300DPI at finished size. As always, if youre unsure about your file, just send it to us for verification. Sometimes, our customers still need a screenprinted sticker- for example, screenprinting becomes less costly than solvent-digital stickers when youre ordering very large quantities of 2500 or over. Some customers need a vinyl sticker with a very long outdoor-life, for example, if you rent canoes and need a sticker to go on the bottom of them! and again, this is where screenprinted stickers offer that extra durability. 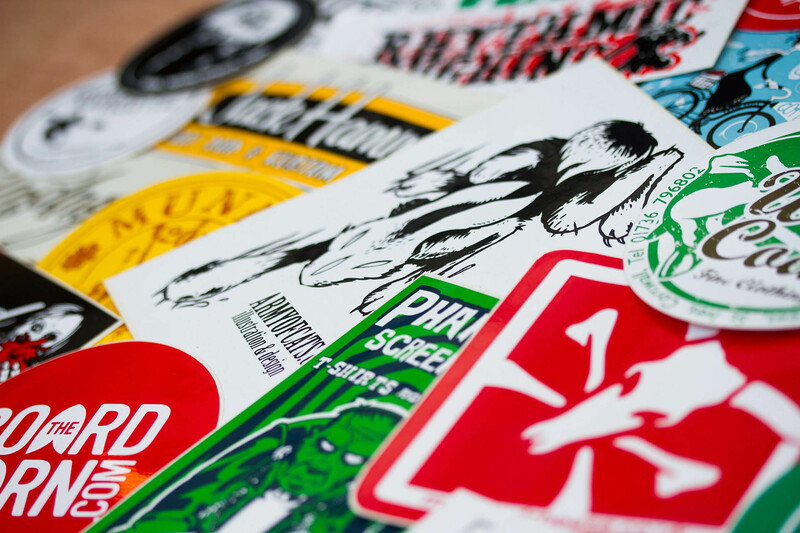 The good news is, we still provide screenprinted stickers for those customers that need it- were one of the last UK printers that still do!! The artwork, the shirt type, colour and material, position, size- you name it, every element of your job needs careful consideration to ensure you get the best result.